Take to the skies with the greatest of ease. If you're a fan of flying games but don't want to necessarily drag out your PC to play Microsoft Flight Simulator, 3D Plane Flying Parking Simulator Game offers the next best experience - and at little cost. You'll take to the skies with four different planes, earning rewards and unlocking new missions in the process. Here are some tips to help you take off and land like a pro. What planes are available in 3D Plane Flying Parking Simulator Game? There are four in all - the Supersonic air jet, the military Drone, the stealth Bomber and the Jet Plane. As you might expect, the physics are a bit unique for each plane, with the Jet Plane handling more like a mid-air tank and the Supersonic and Bomber requiring some precision for turns. However, they all adapt to an easy-to-use control system, featuring an accelerator stick and a flight stick to control your direction. How do I take off in 3D Plane Flying Parking Simulator Game? Adjust the accelerator to reach the desired top speed, then pull the stick back to get off the ground. You'll want to be quick about it for some missions, as you may hit rocks or run out of runway if you take too long. The faster, the better. How do I land in 3D Plane Flying Parking Simulator Game? It's the opposite of taking off. Adjust your wheels for landing when you get near the runway, and take it lightly, or otherwise you'll crash. Once you've landed, adjust your speed so you begin slowing down, to the point you gradually come to a halt in the appropriate zone. It may take a couple of tries to master, but you won't be penalized for it. How do I complete missions in 3D Plane Flying Parking Simulator Game? Mainly, your job is to fly through rings scattered throughout each stage, and they're pretty easy to spot between their bright green color and the arrow indicators that show you where the next one is. Each mission comes with up to three stars to earn. The first is for completing the mission in general; the second is by completing flight through all the rings; and the third is earned by beating the pre-set time for the stage. It's moderately easy to earn them all, but just with getting the first one until you master the controls. Is there a way to speed up time in 3D Plane Flying Parking Simulator Game? These are real planes you're dealing with, so no. You'll have to stick out the ride the same way you would a real plane. How do I view video replays in 3D Plane Flying Parking Simulator Game? When you complete a run, you can choose the option to view the replay, from which you can choose from various angles. It's fun for flight connoisseurs, but hardly essential. 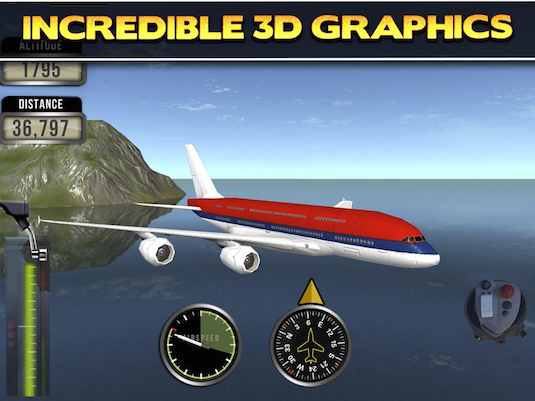 Do I need to pay for anything in 3D Plane Flying Parking Simulator Game? The Normal mode of the game is free-of-charge, but you can add extra funds to unlock new modes, as well as remove those pesky pop-up ads. The Deluxe Pack is your best bet for $14.99, unlocking Kids, Baby and Fun modes, as well as all the levels. You can also buy these items individually, ranging from $0.99 to $4.99, depending on what you want. It's best to try out the normal mode first.